Although I first started on the violin, I have been playing cello for about 16 years. I have performed in various ensembles all over the Phoenix (Arizona) valley. As a young musician I was a member of the Phoenix Youth Symphony (which has played side-by-side with the Phoenix Symphony Orchestra many times), Regional, and All State Orchestras. When pursuing a cello performance major in college, I have played in the Arizona State University Symphony Orchestra as well as the Visiting String Quartet program. Outside of school, I have performed with various orchestras, chamber ensembles, churches, and special events (such as weddings and military balls). For community outreach, I have played at assisted living centers, hospitals, art museums, and schools. I have also had the great opportunity to perform at the Lincoln Memorial Center in New York City as well as play at various venues in Williamsburg, Virginia. Having a family full of teachers, teaching has always come naturally to me. 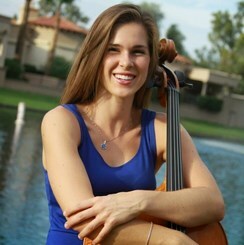 I have been teaching private cello lessons for a little over 8 years now. I have also been the assistant coach at various chamber music festivals in Arizona. Recently, I have received a Teaching Certificate for Elementary Education, and before moving to Virginia, I had the opportunity to substitute in various classes/grades (including General Music and Strings). As a daughter of teachers, I have always recognized the importance of education, and as a musician, I have especially come to realize the value of a musical education. From experience, musicians bring forward a uniquely fresh and artistic view into the world which adds variety to not only the academic realm, but society as well. Music is a great place to learn responsibility, individuality, creativity, determination, hard work, leadership, discipline, and so much more. My desire is to introduce (and hopefully inspire/enhance) musicians to utilize their talents to bring joy to themselves and others through music. My teaching style is to incorporate a positive atmosphere as I work with each student’s individual skillsets. And I know that I will learn just as much from these students as they learn from me!